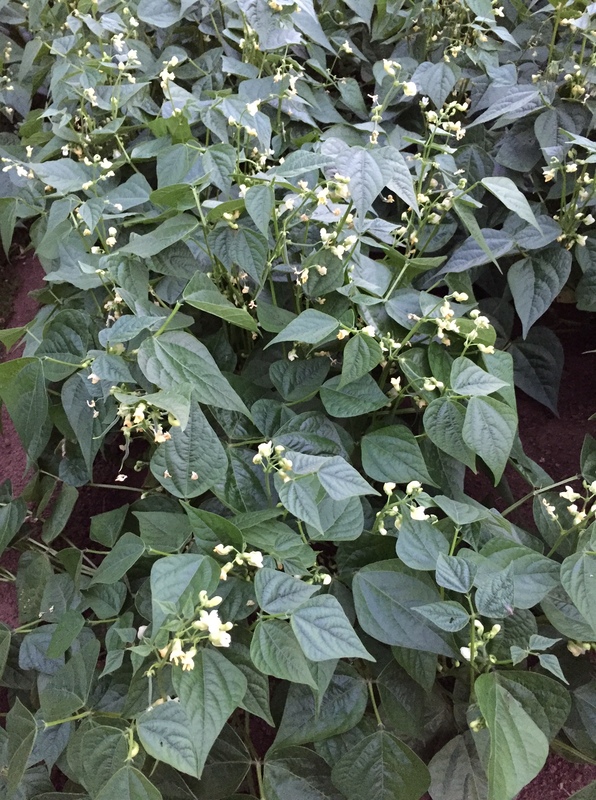 I have so many green bean blooms coming on the bushes, it’s almost scary:) I can see teeny, tiny beans forming, so I know I’ll be canning in a week or 2, and canning….and canning….. I’m excited. I like canning, and did not get to can last year. 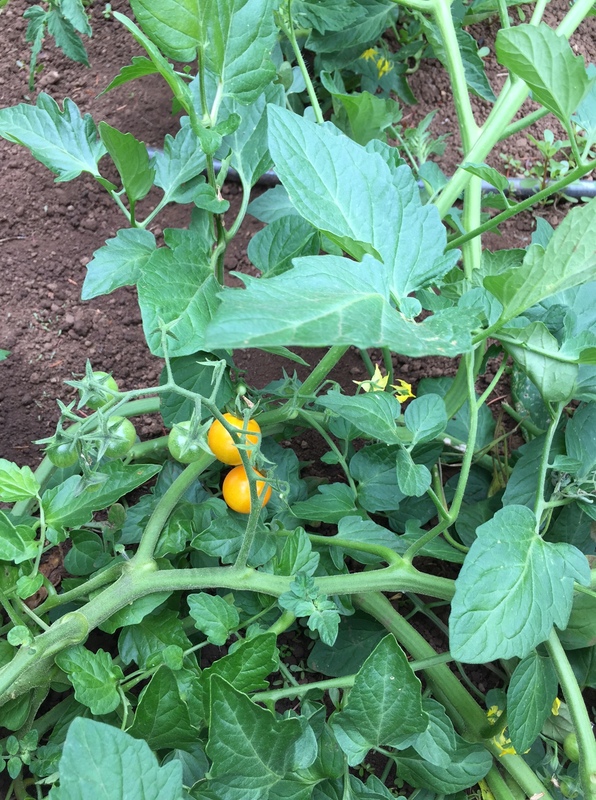 I got 2 ripe Sungold tomatoes, and 3 small Glacier Ultra Early tomatoes, but that’s it. There are no more that look like they are even remotely ripe, but there are lots of green ones forming. I will still buy tomatoes for a while, but the day is coming when I’ll be eating and canning those as well. I had zucchini in a stir-fry for dinner tonight. I’ve picked a small one and a very misshapen/half rotten one, but was able to salvage the rest. There are lots more little ones coming along there, too. 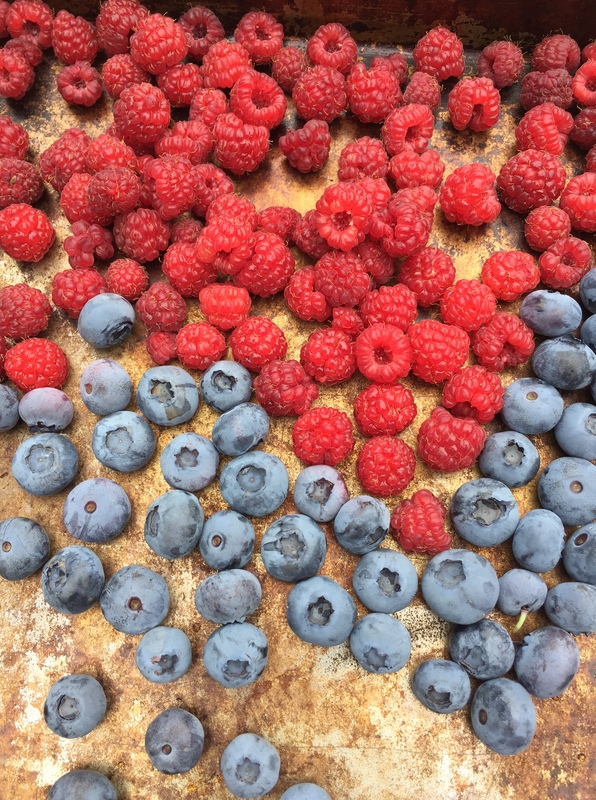 I’m getting a few raspberries and blueberries every few days. I have a few cups of raspberries frozen already. The Marion (black) Berries are starting to ripen. There won’t be very many this year because we moved the entire patch last fall, but we will get a few. I can pick wild blackberries this year. Today, when we mowed the lawn, I took the grass clippings and mulched the Marion Berries with them. I’ve been able to keep them weeded out, and want them to have a good chance to get a foothold this year—-weed-free with plenty of moisture. 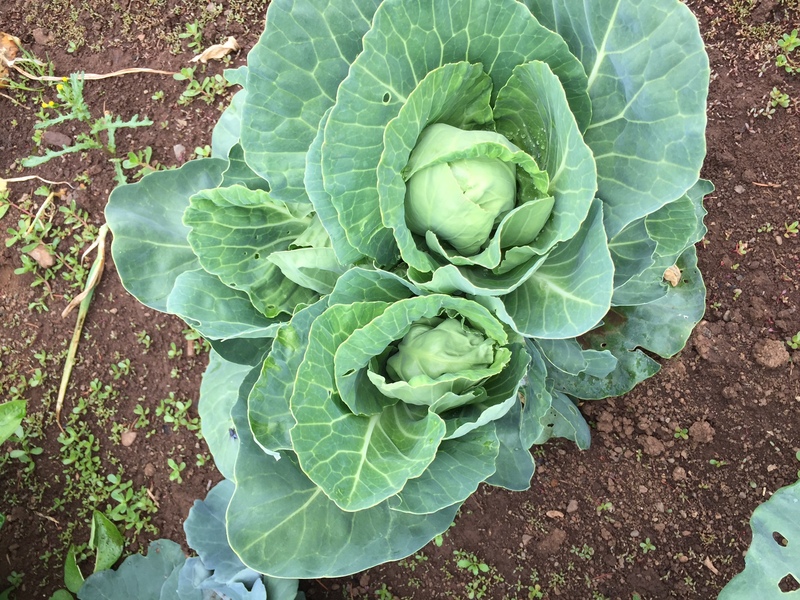 I left 1`bolted cabbage. Then, I chopped off the bolting part to experiment with it. It started forming some tiny little heads. I’ll see if anything comes of them. Thankfully, my sister told me she will have cabbage to share. I did plant 6 little plants for a crop in the fall. Hopefully. We have harvested broccoli from each of the 5 plants that survived. We’ve had it one time. Lovana has eaten the rest. The heads haven’t been super big. Although it’s a lot of broccoli, it’s nice to see her eating veggies! I still have side shoots coming along. 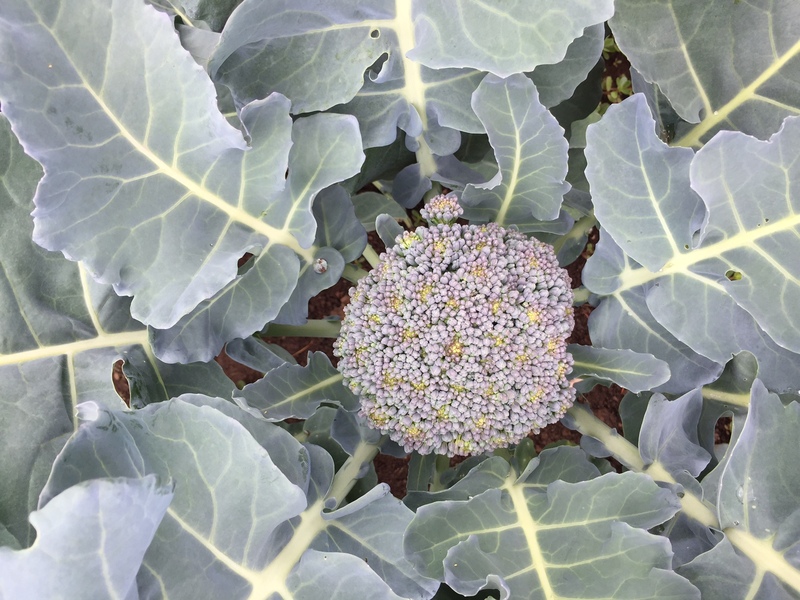 I’m not sure if I will try a fall crop of broccoli. I will see how my time and energy holds out. I’ve been able to weed quite a bit in the flowerbeds this week. There are still lots of weeds to pull, but it’s nice to see some progress. The nasturtiums have begun to bloom and I’ve cut many, many old, spent blooms off of the dahlias and roses. 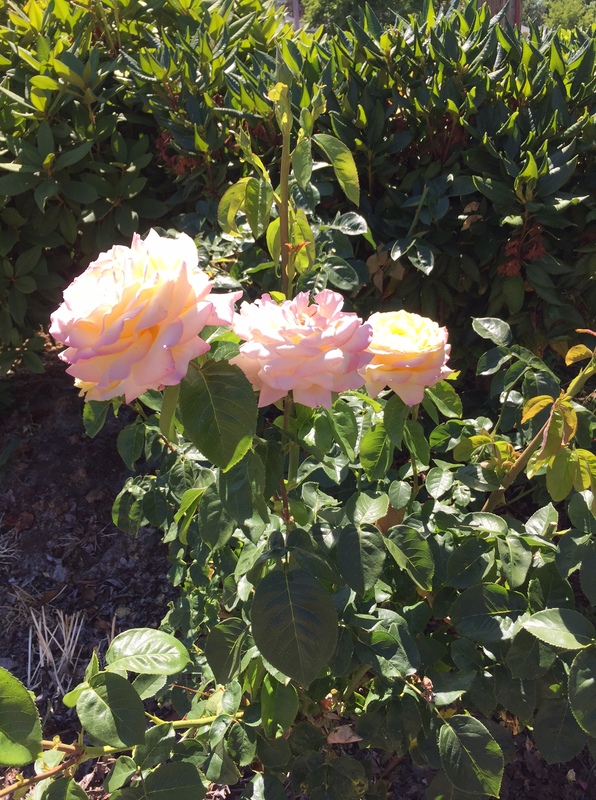 Rob put some systemic rose food and black spot deterrent on the roses, and I can see a little bit of difference in them. They still have a long ways to go, though. I did mulch a couple of them with grass today, and have put ashes on them as well. It’s been pretty hot, so we have watered a lot. We are very thankful for the fact that there is a well here on our lot and the watering system is connected to it. We have one of the greenest lawns on the block for that reason. There is no way we would water so much, except for vegetables and a few flowers, if we had to pay for all that water. It’s a real blessing. Everything looks so wonderful and I adore those unique geraniums with the red flowers and pale green leaves. I do, too. This year, I found one here, and one there, and chose the most unusual ones I could find. I did not even know so many kinds existed, and it was fun finding, and growing, them. I noticed a slat missing from the blind in the picture of the dalias, is that where the creepy salesman peeked through the window? If so, it means he had to step into your flowers! He was certainly a peeping Tom. Yikes. Tell Rob to hurry and get that blind up NOW. 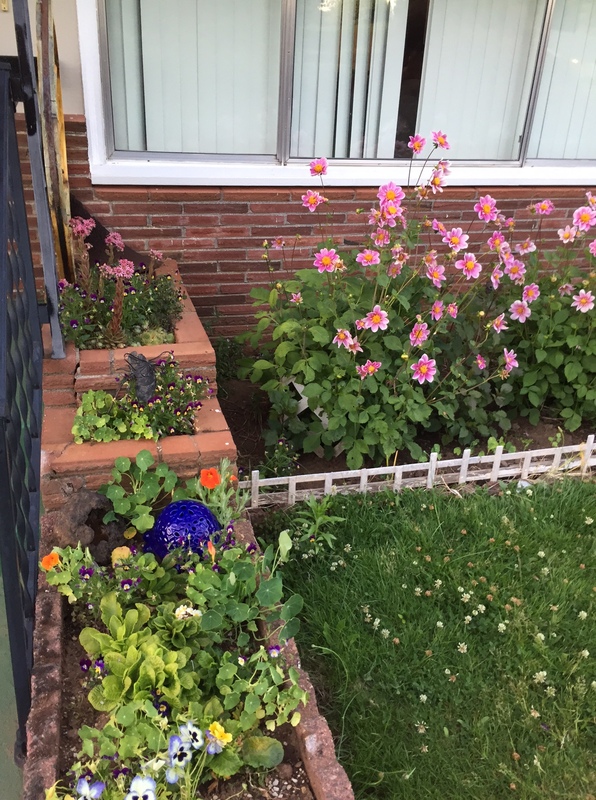 Last question, in the picture with the purple petunias, is that a rock in the middle of the bed with flowers growing out? Can’t tell on my computer screen. As a last reminder, tell Rob to really, really, hurry up with that blind. Oh, and since I am nagging on Rob, I will fuss at you also. You should have not opened that door!!!!! Mercy, mercy, mercy. It is a rock, with some kind of sedums in it. It was there when I moved in. As for the window, yes, that’s the one. He did not get into the flower bed, just looked in from the sidewalk about 4 feet away. STILL! As for opening the door–I’m sure the poor kid didn’t know what hit him, when he was treated to the sight of ME, with my hair all messy, and my big bathrobe. I would have just yelled for someone if he had been threatening at all. So, everything is measured, and Rob is working with a lady from Home Depot, but it’s an odd size and needs to be ordered. I do have plans to keep succession planting as long as I can. At the old house, Rob just kept tilling up new garden spaces for me and making new raised beds. Here, my space is limited, so I am utilizing it better. Today, for instance, I picked and washed lots of lettuce–the good part of the row that was starting to bolt–then pulled the row. 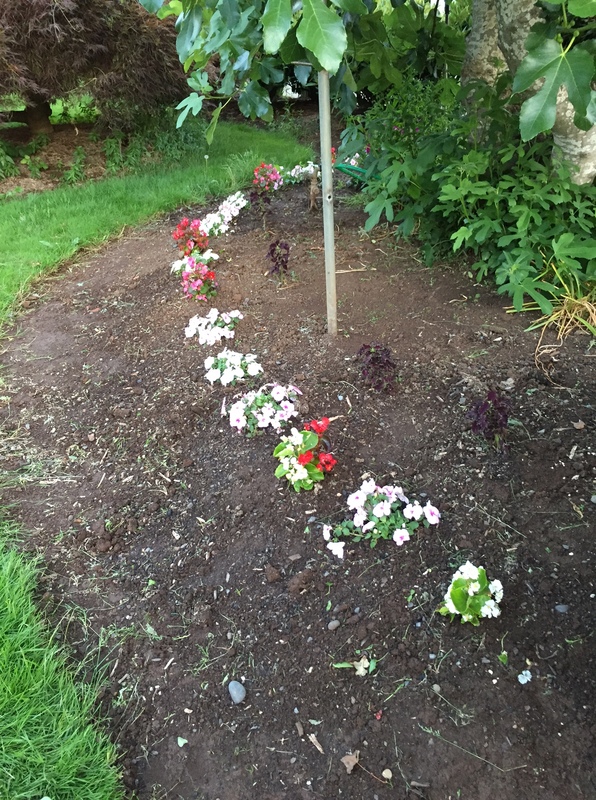 I have 3 more plantings in various stages, so I should never have to go without–for very long, anyway. Sometimes heat makes it bolt unexpectedly despite my best intentions. Today, I worked in the garden for a long time this morning. One thing I did was to transplant tiny little butter crunch seedlings so they could grow heads, instead of my usual tightly-packed mixed row. (I took the babies from the row I seeded a couple of weeks ago) It is my favorite lettuce when it grows into loose heads, and I just harvested and annihilated the small row where I had done that a few weeks ago. I am enjoying watching how you do succession plantings, getting ideas as to what to try. I would give anything (except going to Kroger) to have a good head of garden raised buttercrunch lettuce for a salad. It is just too hot here right now. It is my favorite lettuce of all time:) I’ve eaten all my big ones that matured, and did plant out some itty bitty baby ones, but until they grow into heads, its leaf lettuce for me. Soon, I’m going to pick my Frizzy Headed Drunken Woman Lettuce. It’s from Territorial, and is just a nice spotted lettuce, but I grew it first because it had such an interesting name, and then continued because it didn’t bolt quickly, and tasted good. Love the update and your photos. It’s amazing how much farther along your garden is. Way to go to have well water! 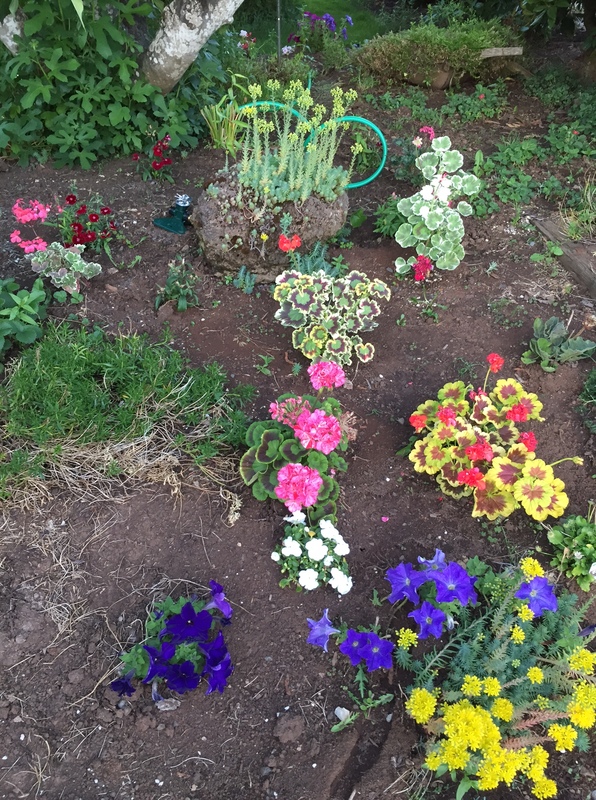 My house did not have a water meter which I was forever thankful for – between the garden, lawn, teen and homestay students paying for water would have really crunched the budget. Have you ever tried Broccoli Raab? One of the gardeners at my community garden offered me some this week. I liked it so much I went out and bought seeds. It tastes like broccoli only it doesn’t ever form big heads. You just pick off the shoots that look like mini-heads. This gal said she’s been harvesting for about 4 weeks. I was close by when she wanted to off load some. Lucky me. According to my local seed catalog they offer two types. 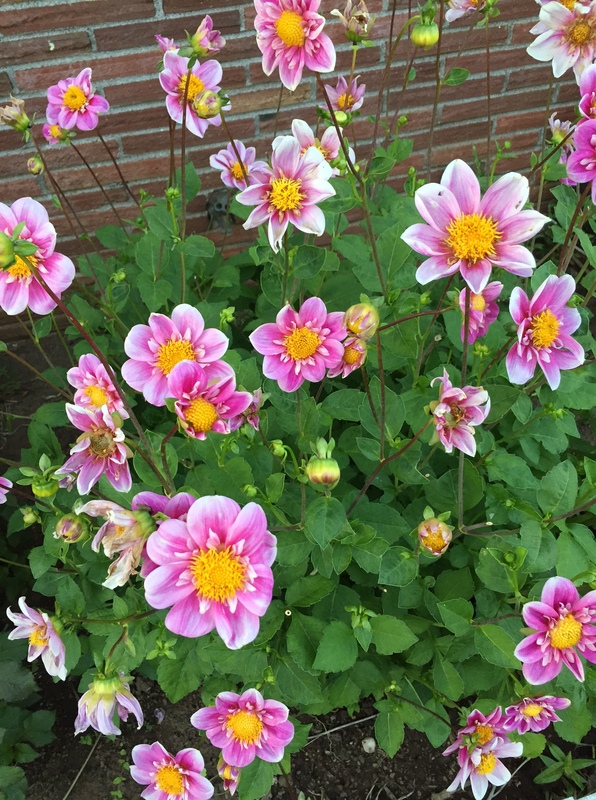 One can be planted through late summer. Another can be planted late summer to early fall. Thought you might be interested. I’ve never grown broccoli raab, but I’ve had it to eat before. I liked it. I just pressure can the beans. I usually do mostly quarts, but this year, I may do more pints, since there are more and more times where there are so few of us home anymore. 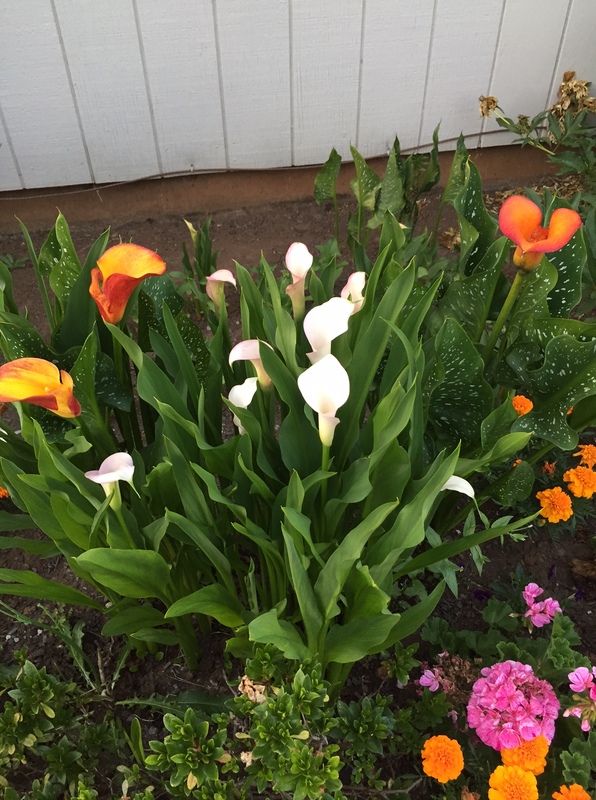 Your garden is so beautiful and productive! I’m still doing battle with the slugs eating my pole beans, but the bush beans are looking pretty good. I do need to plant another row of them. I looked at my peas tonight and I should have some to harvest within the next fews day. I plant those for my hubby who eats them straight out of the shell. 🙂 Be blessed and have a great weekend! Those slugs!!! We battle them constantly as well, but they do seem a little better here than at the last place. Here, I am also battling birds, who want to peck my berries, pull my seedlings from the ground, and so on. 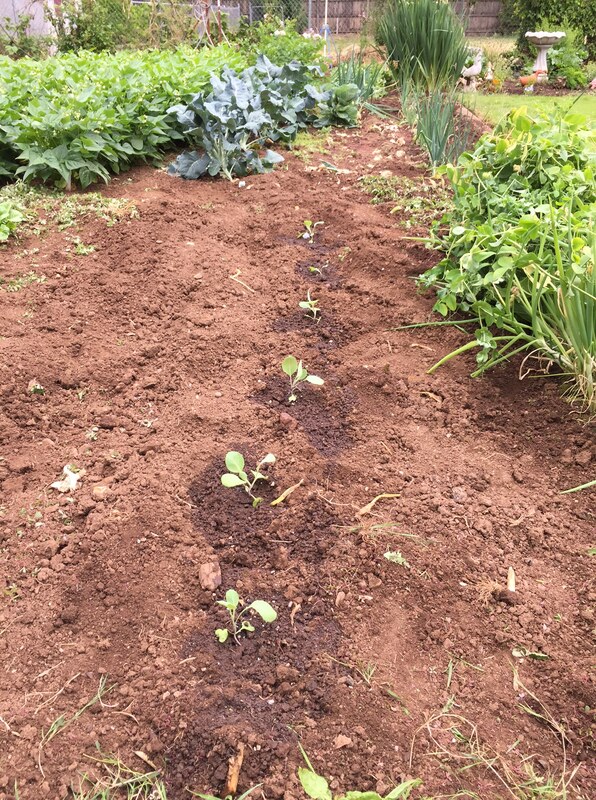 I didn’t get any regular peas planted this spring, just snow peas, but I did get a few put in yesterday that will hopefully become a fall crop. I’m also only aiming for a few fresh ones–not a large crop to freeze or anything. Wow! Everything is looking great! I have green bean envy. I just do not have enough sun to grow them. I do have loads of cherry tomatoes though but like you they are all green. Here’s hoping for some ripe ones soon. We were at the lake for 10 days so I am catching up. Looks like you had some fun things going on and a great camping trip. The black sand is intriguing. Ours is orange because of all the red clay here. Do you grow a garden at the lake? Or is your garden at your other home? The garden is all in pots at home. We only have enough sun to grow anything at all on one end of our deck. The lake is in total shade too and we own that house in partnership with others so no growing there either. When we downsize for retirement it is my goal to have at least part of the yard in full sun so that I can have some raised beds.